All Things Made New explores the Christian mysteries in the tradition of St. John the Evangelist, and Mary, the Mother of Jesus, by studying the symbolism, cosmology, and meaning of the Book of Revelation, as well as the prayers and meditations of the Rosary, including the Apostles’ Creed and the Our Father. These reflections lead us step by step to the foot of the Cross, and to the Wedding Feast of the Lamb, where all things are made new. Stratford Caldecott is the editor of Second Spring and Humanum, and one of the editors of Magnificat in the UK. His books include The Seven Sacraments: Entering the Mysteries of God (Crossroad, 2006) and Beauty for Truth’s Sake: On the Re-enchantment of Education (Brazos, 2009). He lives in Oxford. For more, see www.secondspring.co.uk. “Stratford Caldecott goes bravely into the mystical depths of Christian life and takes his readers with him, eyes wide open. "A wide-ranging, exciting, and erudite exploration of the Christian mysteries. Stratford Caldecott, with insight and patience, leads us through the complexities of the Book of Revelation, the Stations of the Cross, the Rosary, and much more, revealing as he goes along the radiant beauty and truth of these ancient writings and practices and their profound significance for today's believers. A splendid achievement." — Philip Zaleski (editor of the Best Spiritual Writing series). "This is a unique book, and one that deserves an audience. It is a partly a book on the Apocalypse, but cannot be filed directly on the biblical studies shelf. It equally belongs on a shelf of spiritual direction, on a shelf of metaphysics ranging from Thomas to Bulgakov, it is at home in both Latin scholasticism and Orthodox philosophy, it is a guide to morality and the virtues, it opens up biblical hermeneutics — particularly by a symbology of numbers — and most of all it orientated toward liturgical life. 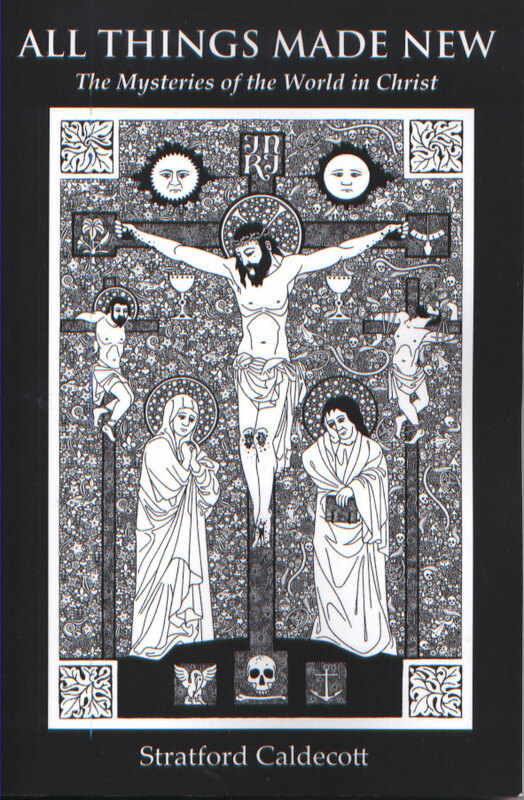 But it is liturgical life beating at the center of the cosmos, which is what John's apocalypse is really about: new life, renewed creation, deification. Rather than surrendering the book of Revelation over to the fundamentalists, who each read it idiosyncratically, the book deserves to be reclaimed by the average Catholic reader (not just the specialist historian) and this unusually rich approach makes this possible." — David Fagerberg, University of Notre Dame. 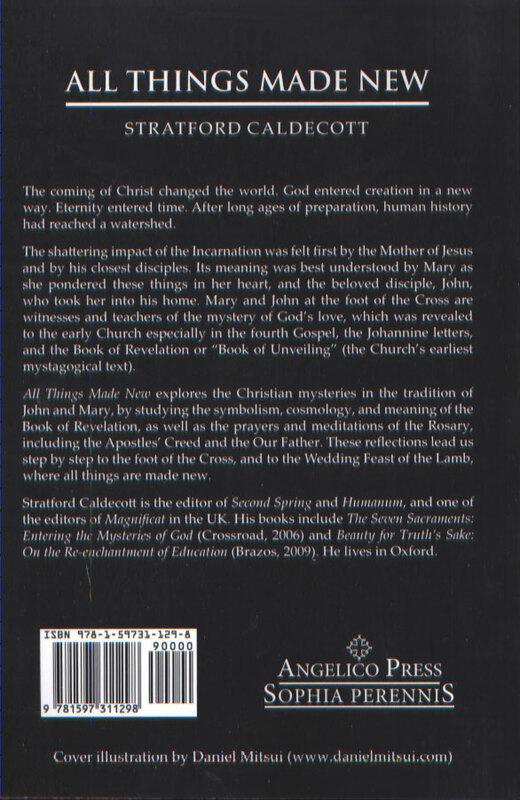 “Stratford Caldecott’s book takes the idealist school of interpretation to new cosmic heights by stressing the unity of myth and history within the framework of Christian revelation. It tames the otherwise occult ideas of Pythagoreanism and other similar philosophies, purifying them of their anti-Christian tendencies by affirming the mystery of the Incarnation. Caldecott explains with great insight, including the use of number mysticism, the full flowering of Christ’s coming in the flesh through the Church, as unveiled in her liturgy, her creed, her ethics, and her tradition of the Christian mysteries to the end of time. An especially interesting aspect of this unveiling is the threefold manifestation of the Bride of the Apocalypse, through the Virgin Mary (the spouse of the Holy Spirit), the Church (the Bride of Christ), and Sophia, who is the New Creation and Bride of the Father offered to Him by the action of God the Son and God the Holy Spirit.” —Eduardo P. Olaguer (author of Son of God, Son of Man). Order online through Amazon or through your local bookstore.